The number of registrations under the Serbian country code Top Level Domain .RS has been steadily growing since the release of the domain in 2008. 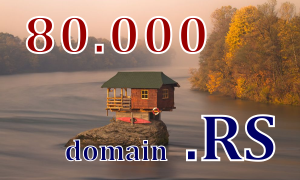 Serbian national internet domain .rs reached 80,000 domain registrations in September 2013. The majority of .rs domain holders are companies and organisations as well as individuals. Being one of the youngest country code domains in the world, the .rs domain (released in 2008) has achieved a steady growth recording more than 75,600 domain name registrations at the end of 2012. Serbia’s IDN ccTLD (Internationalized Domain Name) in Cyrillic .срб has been in existence for only a year and a half and has so far approached the mark of 3,800 registered domain names. It may be worth noting that in December 2012, the percentage of .rs domain names held by legal entities was 76% compared to 24% registered by individuals. This goes along the trend of increased interest in country code domains. Businesses thinking seriously about doing business in Serbia should consider registering their brands, trademarks and company names within .sr national domain. For those entities that do not have local presence in Serbia, Web Solutions offer Local Proxy service. For more information contact our Support Team at support@web-solutions.eu.